Within the last decade, computer-based plug-in synths have gradually overtaken hardware as the primary weapon in keyboardists' arsenal. The flexibility, convenience and low cost of plug-ins certainly cannot be argued. But what if you're a live-gigging musician? You could take a laptop to the gig, but laptops are delicate and generally require external audio hardware for high-quality audio. What if there was a compact, affordable synth module that allowed you to play a range of high-quality plug-ins without the need for a laptop? Enter Use Audio's Plugiator! The Plugiator is a table-top synth module with a sturdy, stage-worthy metal case, roughly the size of a hardcover book. It can hold up to eight different synth "models"; these are each totally different instruments, so it's like having eight plug-ins living in one box. There are endless-rotary knobs for volume, increment/decrement, model select, five knobs for adjusting sound parameters, and three dedicated knobs for delay and chorus effect settings. Blue LED's indicate the currently active model along with ten buttons for direct access to sound presets. The Plugiator also allows access to five sound editing parameters for each model. If you want to access additional sound editing parameters, you'll make use of the included (and creatively named) Plug-In Manager software. Around the back, there's a jack for the included lump-in-the-middle adaptor, a USB connection, MIDI in and thru jacks, stereo output jacks, a ¼" mic input for the vocoder, and a headphone jack. Plug-In Manager is a multi-function dedicated PC app for the Plugiator (OSX version to be released imminently). At the most basic level, it offers graphic interfaces for sound editing of each of the models, just like a standard plug-in. 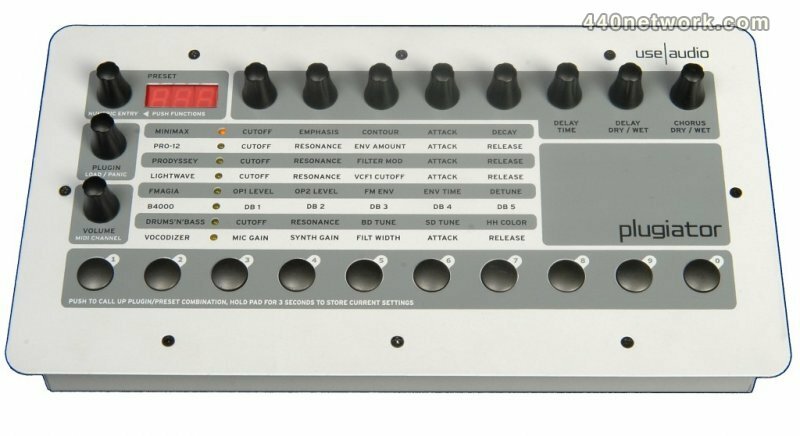 Where appropriate, the virtual front panels closely resemble the classic synths they emulate, so users can jump right in and easily create sounds. Plug-In Manager also allows easy patch storage with a list display of the current instrument's 100 preset sounds. In addition to performing editor/librarian duties, Plug-In Manager allows users to log in to their Use Audio online account where they can download new patches and purchase new instrument models. Once a new model is purchased, Plug-In Manager allows users to load these instruments into the Plugiator via USB. I had some lockups and crashes, but Use Audio confirmed the trouble I was having and sent a pref file patch that fixed things. Generally speaking, the process of downloading new models and installing them in the Plugiator could be more intuitive, but this is version 1.0 of the Plug-Manager software, so it will likely improve. The instrument models are selected with a dedicated knob; only one model can be active at any time. Most of the software models come straight from well-respected Creamware hardware modules, such as the Minimax, Prodyssey and Pro-12. Out of the box, the Plugiator includes Minimax (a virtual Minimoog), B4000 (a "clonewheel" organ emulator), and Lightwave (an original PCM wave synth with atmospheric PPG-style digital leanings). Once the Plugiator is registered, users can download Vocodizer, a virtual Vocoder that takes advantage of the Plugiator's ¼" mic input jack. One thing to be aware of: if you have a low impedance microphone (most dynamic mics with an XLR connector) you'll need a low-Z XLR to hi-Z 1/4" transformer/adaptor for the mic or it won't make any sound. Users can also purchase and download additional plug-ins including Prodyssey (an emulation the classic ARP Odyssey), Pro-12 (a replica of Sequential Circuits' Prophet-5 polysynth), FMagia (an FM synth), and the soon-to-be-released Drums'n'Bass, featuring classic analog drum machine sounds and basses. I started with some Minimax bass patches, and they certainly had the classic fat Moog transistor-ladder filter tone. And unlike the real thing, Minimax is a polysynth with built-in delay and chorus effects, so creamy pads are a no-brainer. Comparing the Minimax side-by-side with a Moog Little Phatty, the Moog had a slight edge in thickness, but in all fairness, the Moog costs over twice as much, and only plays one note at a time. Though usable, I didn't feel the B4000 organ was the Plugiator's strongest plug-in; both Native-Instruments' B4 and Apple Logic's EVB3 have a lot more "grease" and vibe. The Lightwave digital wave synth, adds a lot of nice textural and rhythmic patches that would be great in soundtrack-type settings. The Vocodizer utilizes the Plugiator's mic input and offers easy-to-use vocoder effects without any tricky setup. The Prodyssey was my favorite of the bunch; it really nicely captured the mean, aggressive bark of the original ARP Odyssey synth. The Pro-12 gives nice velvety Prophet-5 polysynth tones, and FMagia accurately recreates the metallic shimmer of FM synthesis. My only nitpicks: patch changes take about a second and make a bit of noise if changed while holding down notes, and changing synth models takes about two seconds. All in all, I was pretty happy with the Plugiator. It fills a unique niche in the market by offering a portable plug-in synth that can be configured at home with a computer, and then used at a live gig while leaving the computer at home. The only other product offering this functionality is the Muse Receptor, which costs about four times as much. The Plugiator has great sounds, great built-in effects and is easy to throw in a gig bag. Gimme one!